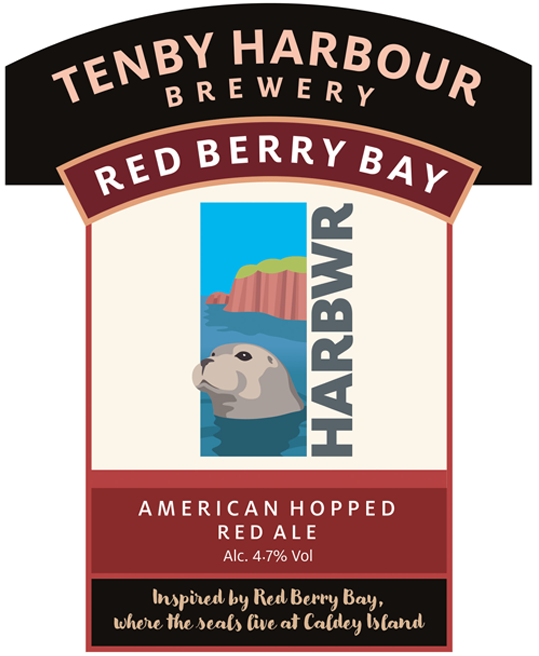 Find out more below about our core range of craft ales, brewed at HARBWR Tenby Harbour Brewery. 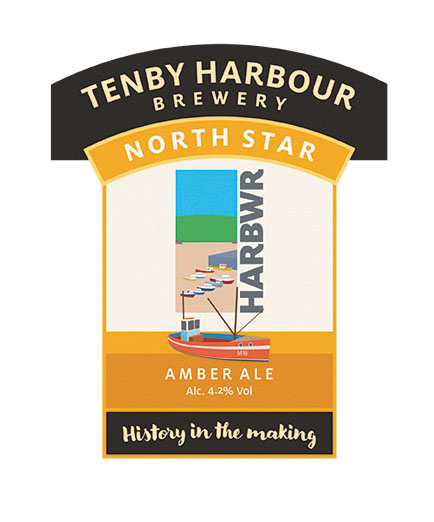 Find out more below about our speciality ales, brewed at HARBWR Tenby Harbour Brewery. A delicious blend of British and German malts provide a complex malt character with a rich ruby red colour. Four different hop varieties provide cedar, grapefruit and floral aromas. Our flagship pale ale, refreshing, citrusy, with spicy herbal bitterness finished with floral and zesty aroma. 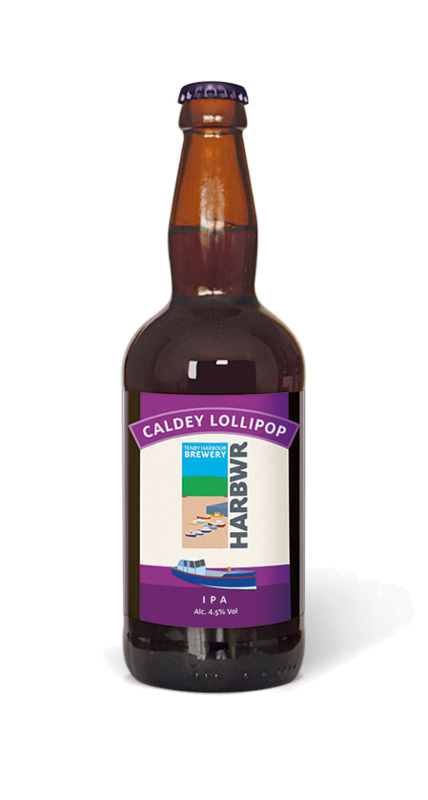 Brewed using traditional Maris Otter pale malt together with a blend of British First Gold and American Cascade hops. Smooth malty amber ale blending herbal bitterness finishing with spicy blackcurrant and lemon aroma. 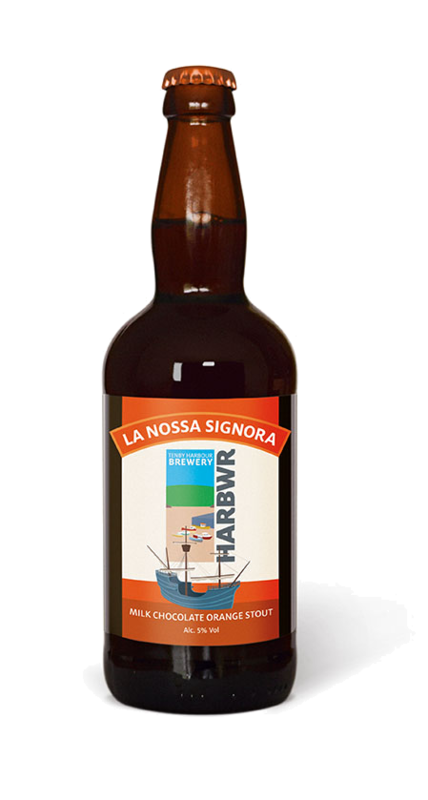 Brewed using Crystal, Amber and Maris Otter malts with British First Gold and Bramling Cross Hops. Deep roasted malt flavours combine with a citrus hop aroma, finishing with a twist of real cocoa and orange zest…La Nossa was the Portuguese ship that brought the first oranges to Wales when she landed at Tenby on 17th June 1566. Hoppy American-style IPA with hints of pine and grapefruit, brewed with Maris Otter and Cara Gold malts to create its golden copper colour with a generous blend of German Magnum, American Mount Hood and New Zealand Wimea hops. Our ales are named rather differently to most craft beers, so where do names like North Star, Caldey Lollipop, M.V. 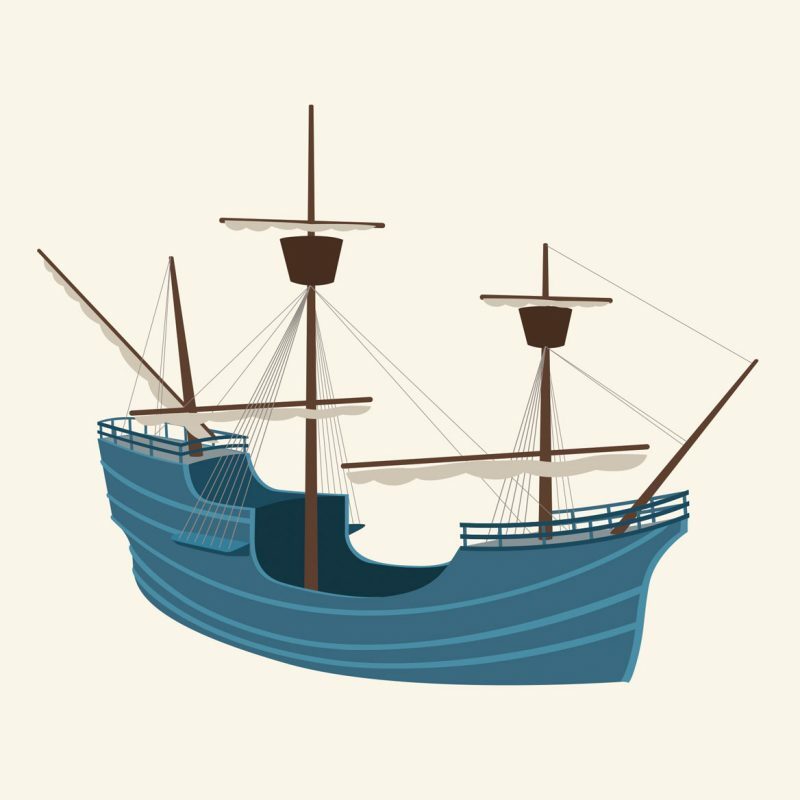 Enterprise, and RFA Sir Galahad come from? Very simply, in honour of this being Tenby’s first ever harbour brewery, they are names of well-known and much loved Tenby boats – names that enable the brewery to capture a little bit of the wonderful friendliness of the harbour community. 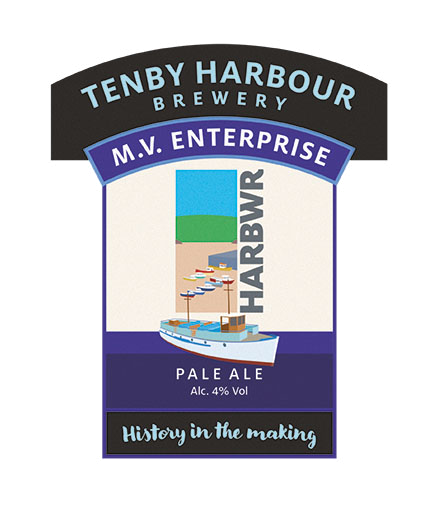 You can learn more about the boats and Tenby’s historical harbour on the walls around our tap room – this is a visit that appeals to anyone with an interest in the harbour as well as enthusiasts of great beer. 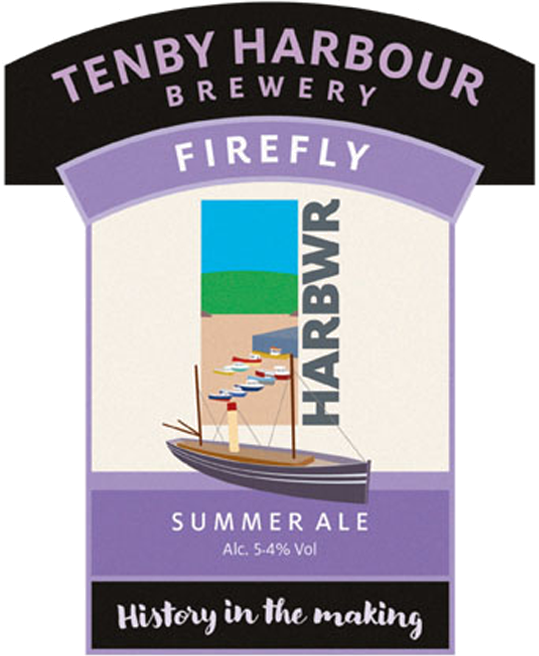 Every so often, a snippet of conversation at the Brewery, a sight down the Harbour, or a national sporting event captures the brewers’ imaginations and a new seasonal or special beer is born. Here the team are picking hops a mile and a half from HARBWR Brewery at Bubbleton Farm Lydstep – which were used fresh in the Proud Giltar special ale. 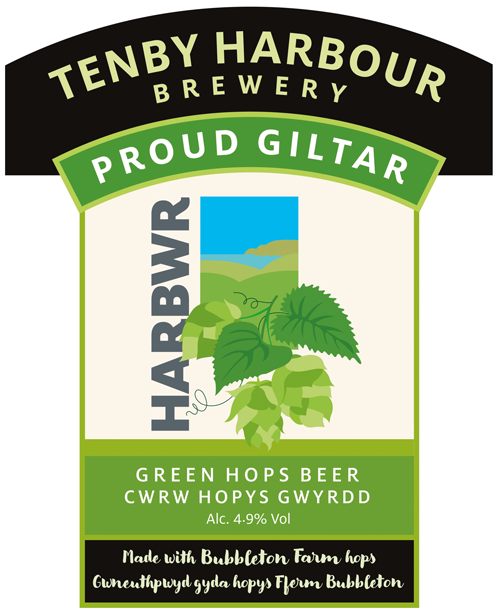 Proud Giltar is a cliff-top promentary that lies between Tenby and Lydstep on the Pembrokeshire Coast Path.This beer shares that name because the hops that were specially grown to give the unique flavour are from Bubbleton Farm, just inland of Proud Giltar.Members of the HARBWR team harvest the fresh hops, under the watchful eye of Tipper, Bubbleton Farm’s owner, and take them the couple of mile or so back to Brewery to add them to their Proud Giltar recipe. This (very) limited special edition brew has a delicious traditional malty bitter base to let the delicious green hops sing – these hops, the first grown locally since 1874, give a subtle but delicious citrus hop character. 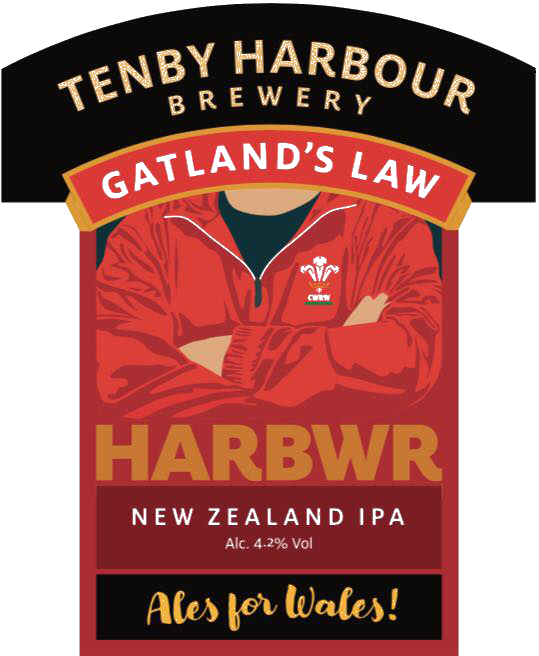 Gatland’s Law is assistant brewer Rob’s first creation, and he is rightly proud of it. 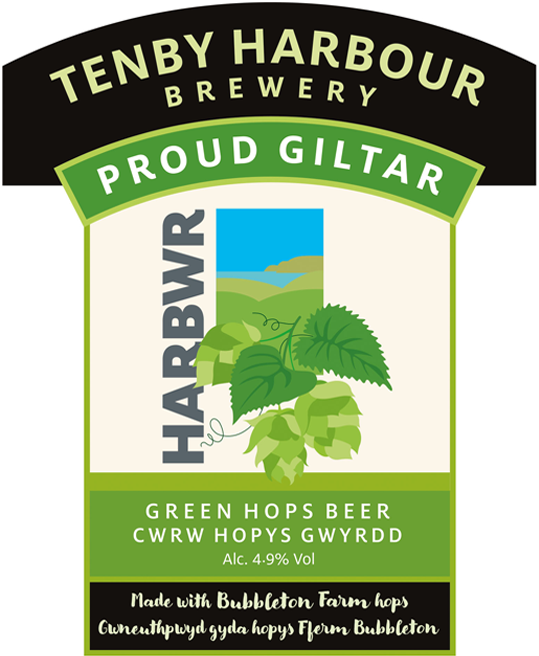 Rob chose New Zealand hops for his ale, and released it during the autumn internationals in 2017 to celebrate Kiwi and Wales’ Coach Warren Gatland’s Wales team taking on New Zealand. 4.2% ABV, New Zealand Pale Ale. Brewed with Maris Otter Extra Pale malt blended with amazing New Zealand hops Motueka (Lemon, lime and tropical fruits) and Nelson Sauvin (Gooseberry, grapefruit). Light in colour. 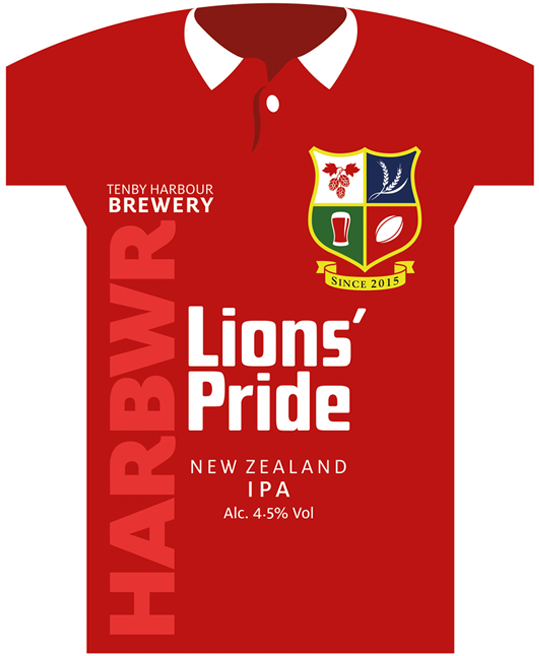 Lions’ Pride was produced exclusively for the British & Irish Lions Tour of New Zealand in 2017, by our rugby-loving brewers. A 4.5% ABV New Zealand hopped IPA. Hoppy IPA with hints of grapefruit blended with New Zealand aroma to dance on the tongue. 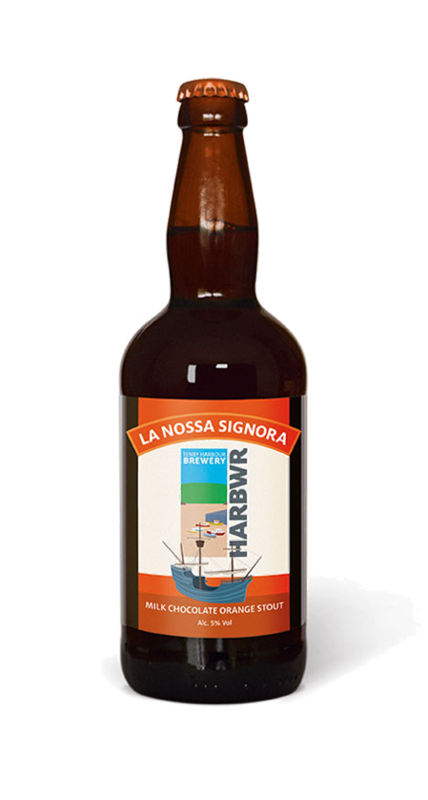 Brewed with Maris Otter and Cara Gold malts to create a rich golden copper colour with a generous amount of New Zealand Waimea hops. 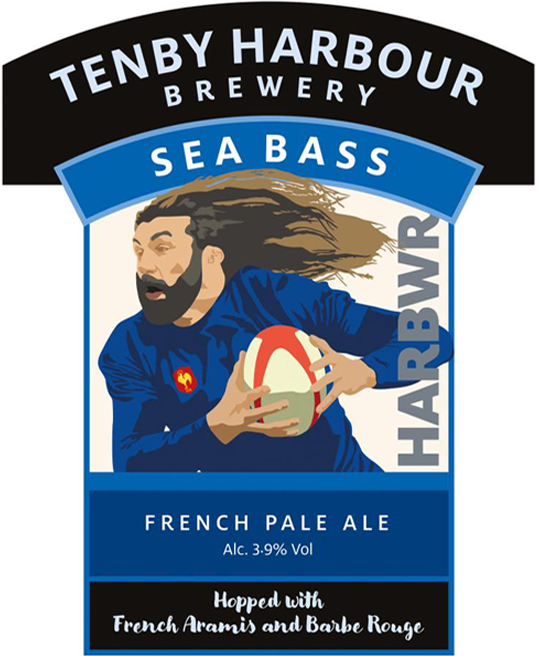 Seabass was produced during the 2018 6 Nations’ Rugby tournament, in honour of the impressive Frenchman with the billowing mane. 3.9% ABV French Pale Ale. 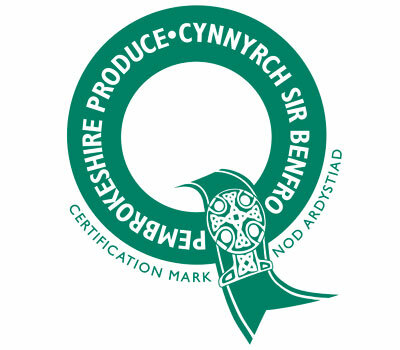 Hops used: Aramis (Floral, grassy; subtle flavour) and Barbe Rouge (cherry, red fruit, strawberry). Brewed using traditional Maris Otter pale malt. Firefly was the first boat to offer an organised service for carrying tourists from Tenby to Caldey Island for a fare of 2 shillings (10p). She operated the Tenby–Caldey service for 22 years until lost in a blizzard at Tenby in March 1916. One of our special edition craft brews with a blend of pale malts and three hops – New European Wolf and Mandaria Bavaria together with American Ekuanot hops. This beer is big on flavour with pineapple citrus and orange hop aroma. Red Berry Bay is on the southern side of Caldey Island, a short boat ride from Tenby Harbour.It takes its name from the red sandstone cliffs at the base of which families of seals bask and play. A 4.7% american hopped red ale. Its malty caramel base will be familiar to those who enjoy our award-winning RFA Sir Galahad, but with a bigger hit of US aroma. Cascade, Centennial and Simcoe hops blend to give a classic american aroma of pine and citrus with a pleasent bitter finish. 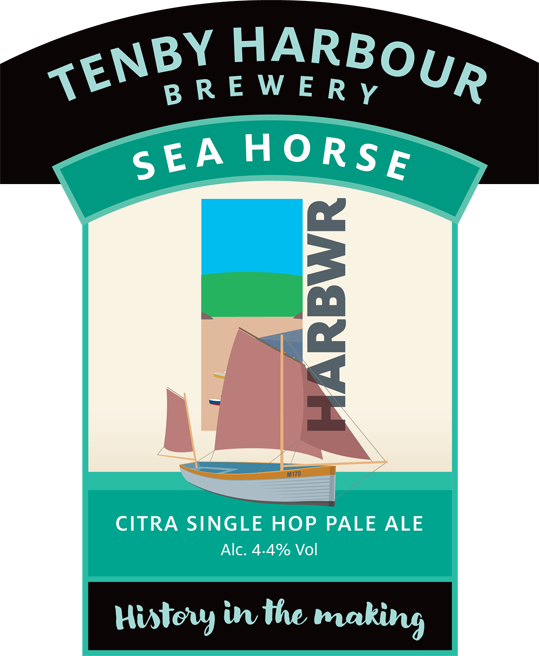 ‘Sea Horse’ Citra Single Hop Pale Ale. bitterness and a delicious tropical citrus aroma. quenching malty base with satisfying mouthfeel. A perfect summer APA! 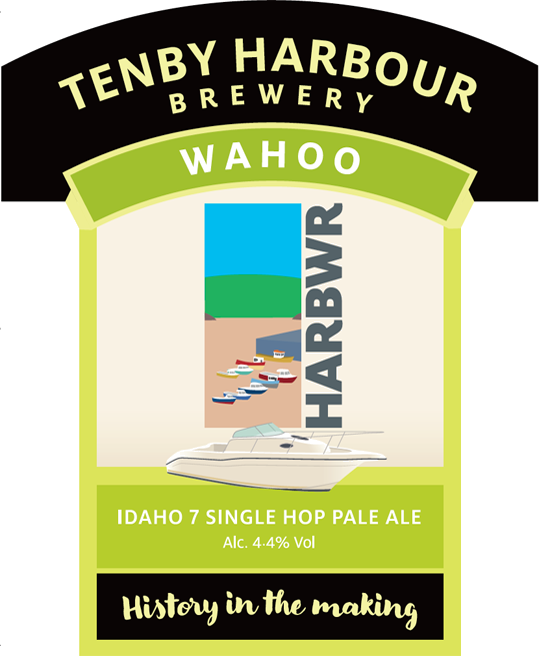 edition cask range… ‘Wahoo’ Idaho 7 Single Hop Pale Ale. finishing with a zesty tangerine orange aroma. quenching malty base with satisfying mouthfeel. 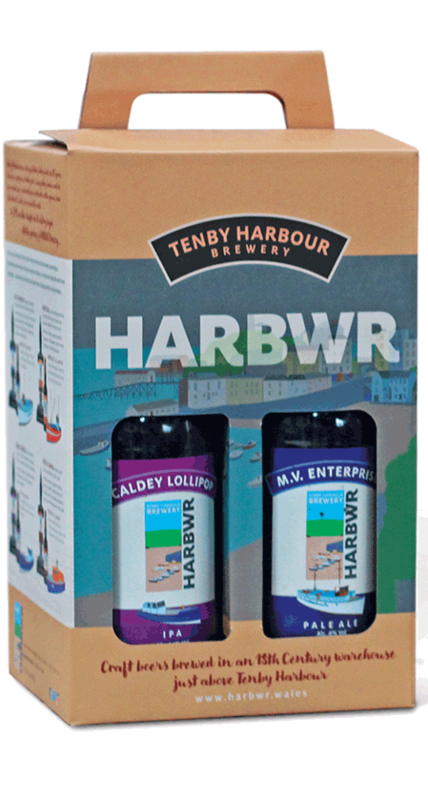 The Harbwr Tenby Harbour Brewery 6 item gift pack, including HARBWR branded glass, 1 x bottle of North Star, MV Enterprise, Caldey Lollipop, RFA Sir Galahad and La Nossa Signora. The Harbwr Tenby Harbour Brewery 4 item gift pack, including 1 x bottle of North Star, MV Enterprise, Caldey Lollipop,and RFA Sir Galahad.